Syllabus of the Online Course (Subject): Mekong Economic Cooperation Strategy (ACMECS). Learning materials in or ( Estrategia de Cooperación del Mekong Coopération économique du Mékong ASEAN). 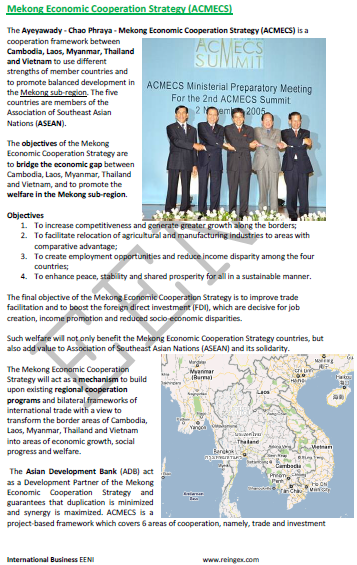 Description of the Online Course: Mekong Economic Cooperation Strategy. The Ayeyawady - Chao Phraya - Mekong Economic Cooperation Strategy (ACMECS) is a cooperation framework agreement between Cambodia, Laos, Myanmar, Thailand, and Vietnam to use different strengths of the member countries and to promote balanced development in the Mekong sub-region. The five countries of the Mekong Economic Cooperation Strategy (ACMECS) are members of the Association of Southeast Asian Nations (ASEAN). The objectives of the Mekong Economic Cooperation Strategy (ACMECS) are to bridge the economic gap between Cambodia, Laos, Myanmar, Thailand, and Vietnam, and to promote the welfare in the Mekong sub-region. Such welfare will not only benefit the Mekong Economic Cooperation Strategy (ACMECS) countries but also add value to Association of Southeast Asian Nations (ASEAN) and its solidarity. The Mekong Economic Cooperation Strategy will act as a mechanism to build upon existing regional cooperation programs and bilateral frameworks of International Trade to transforming border areas of Cambodia, Laos, Myanmar, Thailand, and Vietnam into areas of economic growth, social progress, and welfare. The Asian Development Bank (ADB) act as a development partner of the Mekong Economic Cooperation Strategy (ACMECS) and guarantees that duplication is minimised and synergy is maximised. The Mekong Economic Cooperation Strategy (ACMECS) should benefit from the comparative advantages of the ASEAN CLMT Countries (Cambodia, Laos, Myanmar, and Thailand) to establish a successful and greatly competitive sub-region. The final objective of the Mekong Economic Cooperation Strategy is to improve trade facilitation and boost Foreign direct investment (FDI), which are decisive for job creation, income promotion, and socio-economic disparities' reduction. Cambodia, Laos, Myanmar, and Thailand (Asia) should reinforce and improve the cooperative efforts in agriculture and industry through establishing or improving infrastructure facilities, joint production, international marketing, purchasing agreements, market research, and information development and exchange. All the countries of the Mekong Economic Cooperation Strategy (ACMECS) has Buddhist majority and belong to Buddhist Civilisation.